<!DOCTYPE routes PUBLIC "-//Liferay//DTD Friendly URL Routes 6.1.0//EN"
Redeploy your portlet, refresh the page, and try clicking either of the links again. Notice how much shorter and more user-friendly the URL is, without even having to modify the JSPs. 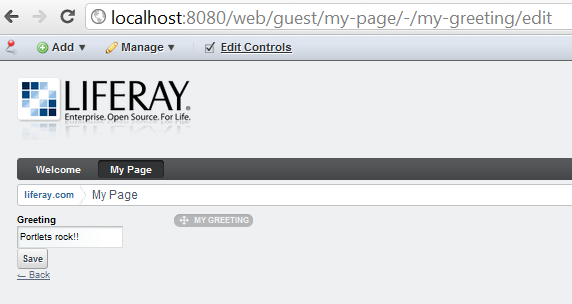 For more information on friendly URL mapping, there’s a detailed discussion in Liferay in Action. Our next step here is to explore localization of the portlet’s user interface.